Maintaining good posture is a fundamental part of any exercise technique. That’s because when you use correct form, stress is evenly distributed throughout the muscles, bones and joints, making you less prone to injuries. Besides if body structures are well-aligned, muscle recruitment is more efficient, which means that the most adequate muscles for the activity will be called into play, requiring less effort and energy to perform it. But do you know what proper form is? Here are some tips for keeping good body alignment during any exercise. Exercise is the best anti-aging treatment. However, most individuals seem to prefer being sedentary and risk having many chronic diseases associated with age. Maybe it is because we are completely surrounded with too many so-called “easy ways to reverse the clock.” Botox, plastic surgeries, anti-aging lotions, you get the picture. Unfortunately, these quick fixes only work on the outside. What about the inside? Our heart, lungs, muscles, and bones – they too suffer the effects of aging. As we get older, we tend to lose muscle and bone mass, our flexibility becomes limited, the production of hormones declines, our cardiorespiratory capacity diminishes, and our cognitive function becomes impaired, among others. The good news is that living an active lifestyle can make your body stronger and more resistant to the wear and tear of time. Regular physical activity contributes to maintain/build muscle and bone mass, keeps your heart and lungs attuned, and improves metabolic function and hormonal production all of which prevent many chronic diseases related to aging. Prevention is the best medicine – I’m sure you heard this before. An overwhelming number of studies have shown that our lifestyle choices are responsible for causing or preventing many chronic diseases. So why is it so hard to improve our lifestyle choices? Maybe it is because we don’t feel immediately threatened by any health issues. At least not right now. However, as we get older chances are that our body won’t be able to deal with all the abuses we do when we are younger. As the years go by, it is more common than not to put on some weight. Then, we blame our metabolism; we convince ourselves that it is slowing down as part of the aging process and it is only natural to gain a couple of pounds, until they start piling up, and you end up overweight and miserable. Also, many will develop high blood pressure, high cholesterol, and diabetes, among others. And now, we blame our genes; it runs on the family, we say. According to Michael Boyle, author of “Advances in Functional Training,” most injuries in sports seem to be caused by very common muscle imbalances. Injuries tend to occur when stabilizing muscles are weak and fail to neutralize the stress placed on a joint and its structures. Moreover, whenever there is an imbalance between opposing muscle groups, the body tends to recruit other muscles in an attempt to stabilize the forces in the particular region. The problem is that those muscles were not designed for this function and won’t be able to do a good job, which allows some of the stress to be placed on joints, tendons and ligaments. As this abnormal muscle activation becomes frequent, it alters the relationship between the opposing muscles, affecting posture, body alignment, and movement patterns. Many people think that because they are not “overweight” by the American standards (weight/height tables and Body Mass Index), they are free to be sedentary and have poor eating habits. Well, if this is your case, you better think again. A new research from the Mayo Clinic found out that people with normal body weight, but with excess fat around the waist are more likely to die from cardiovascular disease than anybody else. This proves that it’s not how much fat you have on your body that matters, but where it is deposited. It seems that abdominal fat has a toxic effect on the body and is associated with coronary artery disease, high blood pressure, and diabetes, among others. According to the researchers, when it comes to determining your risk for cardiovascular disease, you must pay attention to your waist-to-hip ratio, i.e., the waist circumference divided by the hip circumference. A waist-to-hip ratio greater than 0.86 for women, and greater than 0.95 for men, indicates abdominal obesity and increases one’s risk of developing cardiovascular disease in the future. I know you must be thinking “what does happiness have to do with fitness and health?” According to the World Health Organization, health is defined as “a state of complete physical, mental, and social well-being and not merely the absence of disease.” Thus, our overall health depends on how we feel on a daily basis. Unfortunately, our hectic lifestyles can sometimes get in the way of our well-being. Can You Be Skinny But Fat? The answer is definitely yes. Just because you may appear to be within your normal weight range, it doesn’t mean that you are in your best shape. Curiously, most people who were born thin believe that they won the “genetic lottery.” This means that they can eat whatever they want and slouch on the couch for hours, and still get away with it. Well, if that’s your case, I have bad news for you. First of all, thinness doesn’t guarantee good health or greater longevity. In addition, recent research has pointed out that many thin individuals may have a high percentage of body fat. These individuals are considered metabolically obese despite their normal weight. I must remind you that carrying excessive body fat has been associated with heart disease, diabetes, hypertension, gall bladder disease, and cirrhosis of the liver, among others. Unfortunately, it seems that “normal weight obesity” is more common among women. The knee is one of the most injured regions of the body. Women are more prone to knee injuries than men, especially when practicing high-impact sports that involve cutting and jumping. The reason is still unclear, but researchers believe that women tend to have knee motions that make them more susceptible to injuries. Recent studies have found that there is a difference in the way sensory information is processed by the nervous system in men and women, which could explain the differences in injury rates. You are probably thinking: “What the heck are phytochemicals?” Even if you are not connecting the dots right now, I’m sure you’ve heard of them before. 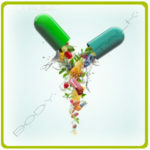 Many articles have been written recently emphasizing the potential benefits of phytochemicals. Phytochemicals are a relatively new class of nutrients. Technically, phytochemicals are not considered nutrients per se, because they don’t provide energy or building blocks to the body. They aren’t considered essential either. However, these substances are believed to have health-protective properties. Recent research suggests that these compounds can perform fundamental protective roles, reducing the risk of developing many diseases such as heart disease and cancer.